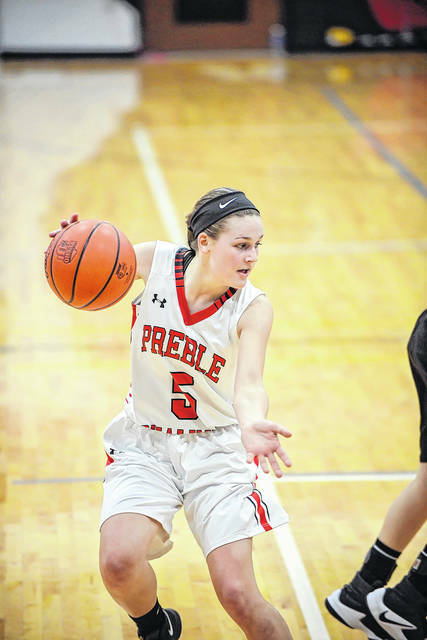 Preble Shawnee junior Nicole Sims paced the Arrows with 18 points in a 51-34 win over Greenon on Thursday, Feb.22, in the second round of the Division III sectional basketball tournament at Covington High School. Preble Shawnee senior Shelbie Brown attempts a shot during the first half of the Arrows 51-34 win over Greenon in the second round of the Division III sectional at Covington High School. 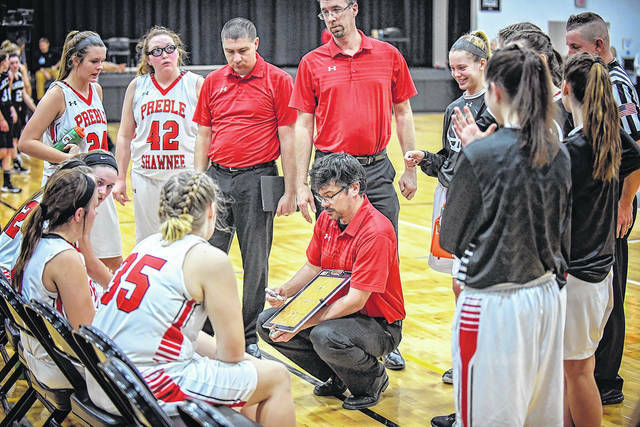 COVINGTON — Preble Shawnee girls’ basketball coach Kevin Schaeffer just wanted his team to relax during its first round sectional tournament game. After all, a majority of his players were a part of last year’s team which reached the sectional final, so the experience should have helped. But the No. 7 seeded Arrows struggled against No. 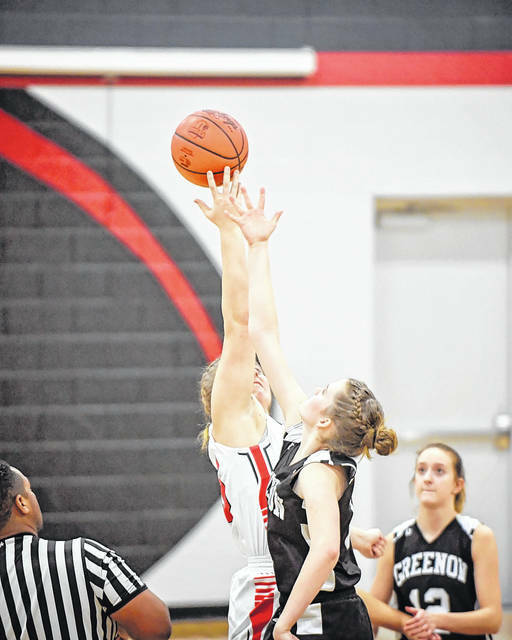 13 Greenon for three quarters before finally pulling away for a 51-34 win on Thursday, Feb. 22, at Covington High School. Shawnee led 12-10 after the first quarter and held a 26-21 halftime lead. 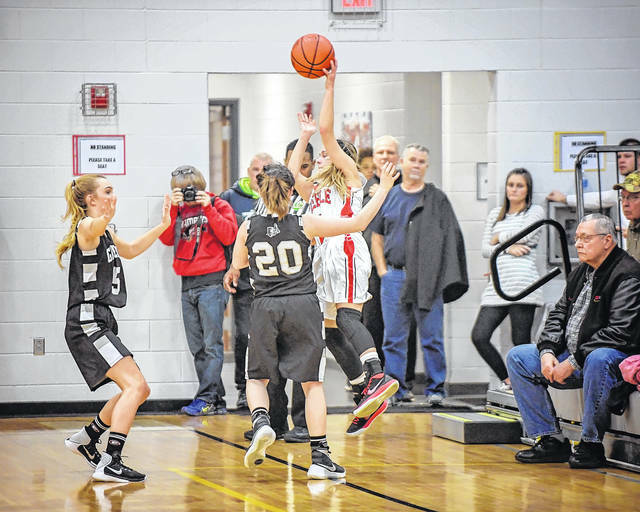 The Arrows extended the lead to 29-21 on a 3-pointer from junior Nicole Sims early in the third, but the Knights closed out the quarter with a 10-4 run to trim Shawnee’s lead to 33-31. The fourth quarter belonged to Shawnee. 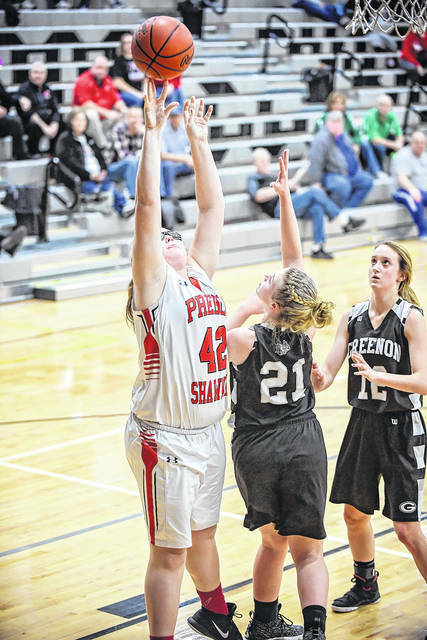 The Arrows made their first five shots of the quarter, while forcing Greenon into several turnovers, and eventually scoring the first 14 points of the quarter to take a 47-31 lead with 3:56 remaining. “In the second half we came out and got some easy baskets. Another thing we had on the board was 10-plus easy baskets and I’ll bet we had 15. 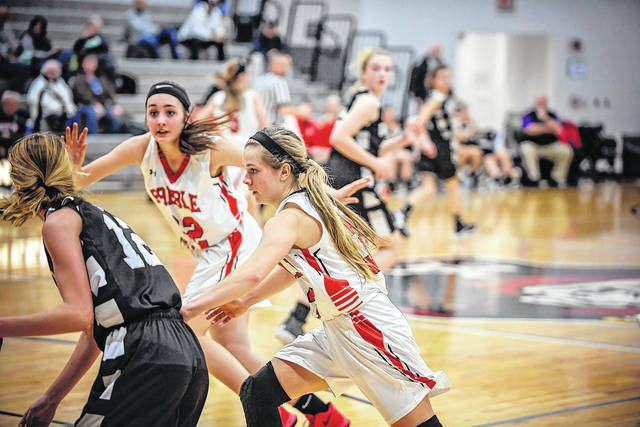 We ran seven, eight turnovers into layups,” Schaeffer said. He also believes the Knights youth may have caught up to them in the final quarter. Greenon has just two seniors on the roster, while rest of the roster is made up of freshmen and sophomores. “I think their youth showed up in the second half. It might be because of our defense, I don’t know. We’ve been here and I think that helped,” he said. Shawnee’s core group is mainly juniors and seniors who saw extensive playing time a year ago. “Playing all those girls last year for pretty much the whole season has paid off big time this year,” he said. Sims led the Arrows with 18 points. Junior Brenna Woodard scored 17 and junior Jenna Lovely added nine. Shawnee (18-5) was scheduled to play sixth-seeded Anna in the sectional final on Tuesday, Feb. 27. The winner advances to the Division III district final on Saturday, March 3, at Springfield High School. “They’re going to be hungry for us. 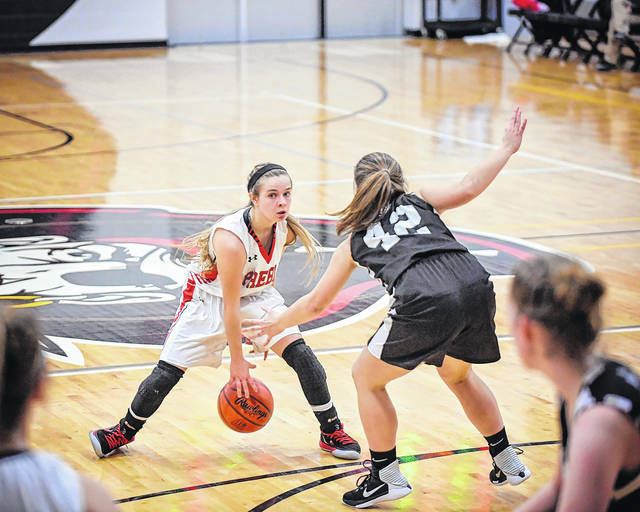 They want to beat us,” Schaeffer said of the Rockets, who lost to Shawnee in the tournament last year. 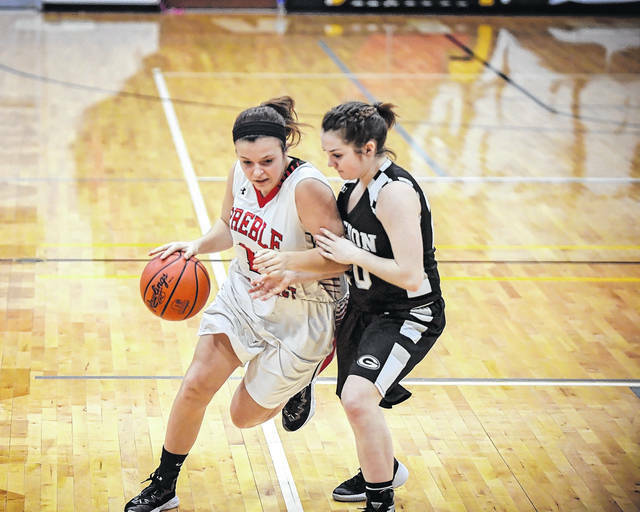 https://www.registerherald.com/wp-content/uploads/sites/41/2018/02/web1_psgbk3.jpgPreble Shawnee junior Nicole Sims paced the Arrows with 18 points in a 51-34 win over Greenon on Thursday, Feb.22, in the second round of the Division III sectional basketball tournament at Covington High School. 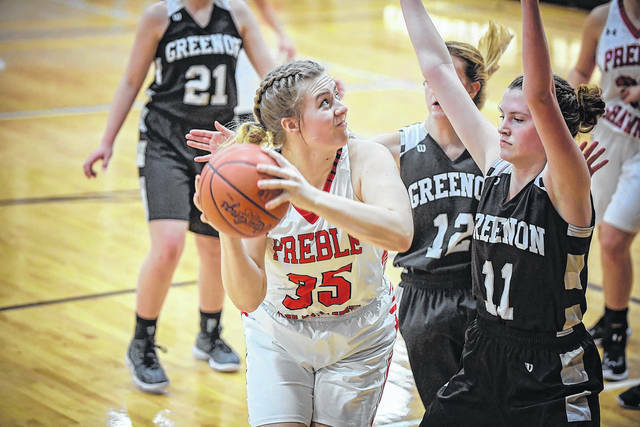 https://www.registerherald.com/wp-content/uploads/sites/41/2018/02/web1_psgbk7.jpgPreble Shawnee senior Shelbie Brown attempts a shot during the first half of the Arrows 51-34 win over Greenon in the second round of the Division III sectional at Covington High School.